Review posted April 2, 2012. Abrams Books for Young Readers, New York, 2011. If you like silly picture books; if you like reading books that make kids giggle, this is just the book. 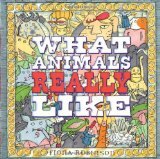 When a child is big enough to know basic animal facts, know how books use rhyme to give you hints, he's going to appreciate the surprises here. Mr. Herbert Timberteeth, a beaver, is preparing for a big event. There's an elaborate fold-out of many animals assembled on stage, dressed in their finest. Mr. Timberteeth is the conductor. We are lions, and we like to prowl. We are wolves, and we like to howl. We are pigeons, and we like to coo. We are cows, and we like to . . .
We are monkeys, and we like to play. We are horses, and we like fresh hay. We are worms, and we like to wiggle. We are warthogs, and we like to . . .
. . . blow enormous bubbles. Eventually, the animals decide they aren't going to sing about what Mr. Timberteeth thinks they like, but about what they really like. Thus, a truly silly song begins. It doesn't rhyme, but the pictured antics are hilarious. In fact the silly details in the pictures will reward reading this book again and again.